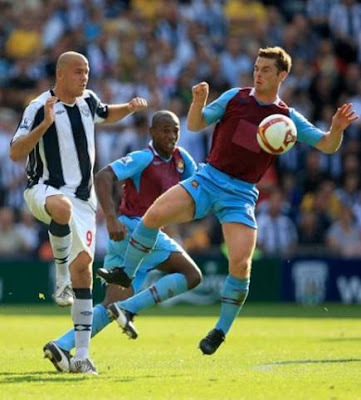 WBA v West Ham - the first unsponsored Premiership match? - With Northern Rock still sponsoring Newcastle United and the credit crunch particularly affecting sponsorship, are we heading for a time where non-sponsored shirts become more commonplace? - An alternative is using shirts logos to support charity. Barcelona (Unicef) and Aston Villa (Acorns) use their shirts to promoting charitable organisations. Will philanthropic use of shirt space increase? 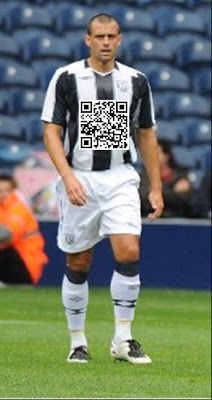 - The other option could be to utilise technology to approach shirt sponsorship in a different way. I wrote about Insqribe's new QR code functionality yesterday and think this could work well for sponsorship if QR codes take off. The shirt would display the same QR code barcode image every week, but each day / week / month the content that the QR code points to could be changed. This would allow a single shirt logo to point to a number of different destinations over the course of a season (the shirt design stays consistent, but what it points to changes.) QR codes clearly need to reach critical mass first, but this could be an interesting development area.